The Russian poster features Ewan McGregor, and states that the film is set to be released in Russia on February 11, 2010 – the day after its world premiere in France. According to Jim Carrey Online I Love You Phillip Morris will open in Japan on March 13 and has been moved to a March 26 release in the US. The new official Japanese website has been launched as well. James McAvoy to appear on Jimmy Kimmel Live! James McAvoy will be a guest on Jimmy Kimmel Live! on ABC on Friday, January 8, 2010. 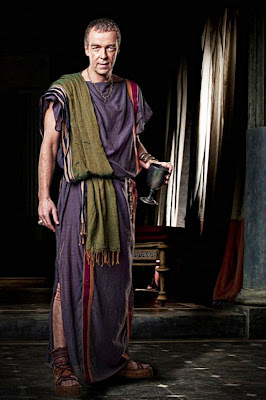 Some character stills from Starz’ new series ‘Spartacus: Blood and Sand’ were released about a week ago. 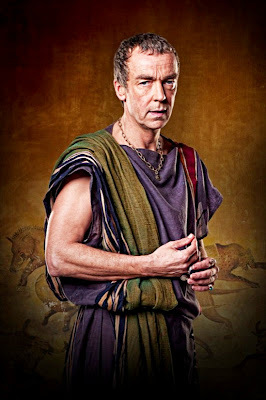 The photos of John Hannah as Batiatus are posted below. You can go here for a look at the full batch of photos. Spartacus: Blood and Sand will premiere on January 22, 2010 at 10pm on Starz in the US. This doesn’t look like an officially released trailer so I’m not sure how long this will stay up. The film stars the voices of Craig Ferguson and Gerard Butler among other Scottish actors. Watch it while you still have a chance. The Last Station’s official website has updated its photo gallery and you can head on over to check out tons of new photos of James McAvoy and the rest of the cast. David Tennant…on Q.I. (Quite Interesting) along with Bill Bailey, Lee Mack & series regular Alan Davies. Dec 24, 2009. Parts 2 and 3 here and here. For more from Saba check out her websites here and here.  Archived in Film, Scottish Entertainment / Actor News and tagged Craig Ferguson, David Tennant, Ewan McGregor, Gerard Butler, James McAvoy, John Hannah, Scotland, Scottish, video. Bookmark the permalink. Is John Hannah really that old or has he been wrinkly-shopped?